Ken Xiao the author is a foreigner who has taught himself to speak English like a native and now he has written a book detailing how he has achieved this so that others may follow in his footsteps and do the same. 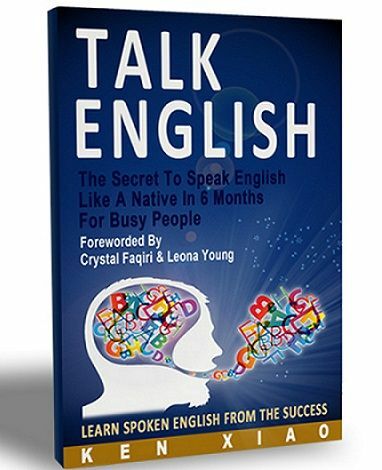 He promises that his book ‘Talk English: The Secret To Speak English Like A Native In 6 Months’ will replace your natural accent with an American or British accent, be able to speak fluently and at a pace suitable for native speakers, have the confidence to converse with the natives and do all this in just six short months. Xiao aims his book at an intermediate audience but says that Beginners may find that they too may pick up enough from his teachings that they will be speaking English like a native in six months. He cites the book as having one single lesson and that you will learn how to speak like a native in six months or less, how to achieve this effortlessly and with a busy schedule, how to speak English without having to translate it first, how to learn grammar without having to memorize any grammar rules, how to pronounce English words as though you are a native American or a native Britain, how to speak English fluently, correctly and naturally just as if you are a native speaker and more. The book is written as a series of step by step instructions that are easy to follow and that aim to have you speaking English confidently, fluently and with a native American or British accent in six months or less. Xiao himself expresses that you will clearly feel his confidence throughout the book on the effective methods he uses to teach you to speak English like a native. He is also giving away a free Vocabulary builder as a bonus for downloading his book.